Sonar Home Studio 6 interface Cakewalk has been many years into sequencer software research and development. Sonar which emerged as a stronger product than the flagship then Cakewalk has grown stronger over the years and offers almost the same (if in some cases more) features and tools for a complete sequencing and production platform. The Sonar Home Studio 6 audio sequencer is a stripped down version of the full Sonar platform starting at just Â£89.00 as well as the Home Studio 6 XL version that features over 1GB of instrument sounds at Â£130.00. First thing first and luckily a painless process. Clear instructions and only few steps before you can get your hands dirty. The good news is that ease of use has won once again over complicated screens and the tracks are visible with extended settings and sample previews. The software feels very plug-n-play when recording instruments. As long as your cable connections are correct there is no reason why you should not be able to start recording. The audio is drawn on the screen as you record so its possible to note mistakes real time. One of the greatest draws to Sonar Home Edition is the loop function where you just need to find a sound, sample or loop and edit it so you can perfect the sound of your liking. 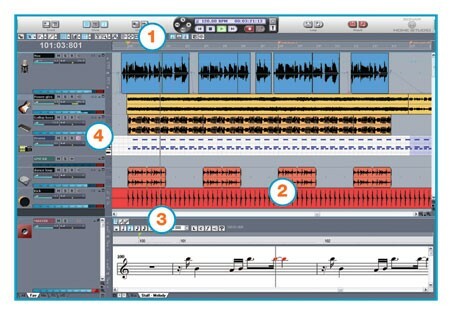 The Loop Construction function gives you all the flexibility of a traditional sampler. The tools available are enough for beginners and if you start messing with the advanced settings you will realise that you need something more powerful like the full Cakewalk Sonar 6 studio edition. But by that time you would have also learned how to handle editing tools of a sequencer that logically apply in almost all other similar products on the market.